Astronomers using the Atacama Large Millimeter/submillimeter Array (ALMA) discovered a nest of monstrous baby galaxies 11.5 billion light-years away. 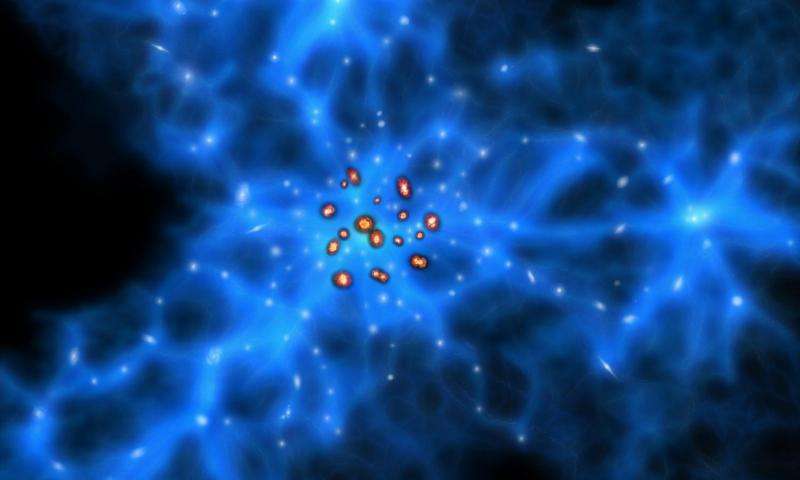 The young galaxies seem to reside at the junction of gigantic filaments in a web of dark matter. These findings are important for understanding how monstrous galaxies like these are formed and how they evolve in to huge elliptical galaxies. The team found that their young monstrous galaxies seemed to be located right at the intersection of the dark matter filaments. This finding supports the model that monstrous galaxies form in areas where dark matter is concentrated. And since modern large elliptical galaxies are simply monstrous galaxies which have mellowed with age, they too must have originated at nexuses in the large scale structure.